In this Kitchen Nightmares episode, Chef Gordon Ramsay visits The Walnut Tree Inn, one of Britain's most famous restaurants, with a Michelin star, previously owned by Franco Taruschio, one of the first TV chefs. It was then bought by Francesco Mattioli, who managed some top London restaurants. He has lost his Michelin starred head chef and had been doing the job himself. Gordon wants to try the food and tells them to cook their best dishes, he is served a boring porcini and parma ham lasagne and an over cooked fish stew with uncleaned mussels and grit at the bottom of the dish. Gordon sits down Francesco to discuss getting a new head chef, they line up interviews where they ask them to cook a dish. The first has high salary expectations and his pasta dish is raw and the second comes from a Holiday Inn and cooks average food. Gordon bans Francesco from the kitchen putting down a red tape line he is not to cross and meets the staff including Kevin, who takes him to the local for karaoke. Chefs Gary and Stefano are rivals and Gordon puts Stefano in charge of the kitchen to cook a lunch for Francesco's family and friends. They are kept waiting for their food and the lunch is a disaster. He swaps to Gary being in charge who has better communication. Gordon goes to the town to talk to the public, they say it is overpriced but lots of people went when Franco owned the restaurant. Gordon talks through the menu with Francesco and believes Francesco should promote one of his Sous Chefs but he wants someone new. Gordon gets Gary and Stefano to cook a meal for Francesco and his wife but to pretend Gordon cooked it. Stefano gets to work on the team prep but Gary only cares about preparing his own meal. The ravioli and Oyster starters are a big hit as are the fillet steak and sea bass mains and Gordon reveals who the dishes were cooked by. Gordon tells Francesco he has to lower prices to get the customers in but he doesn't want to "go down the cheap side". They bring in chef Spencer Ralph and his food impresses them both and they redecorate the restaurant giving it a more cosy look and revamp the menu. For relaunch Gordon insists Francesco invites Franco to the relaunch 40th birthday party of the restaurant. They serve Canapés and Champagne. Gordon discovers Stefano is very talented but also shy and Gary is confident but not as good of a cook. Spencer accepts the Head Chef's job and Gordon convinces Franceso that one Sous Chef has to go and they decide on Gary. Gordon revisits a month later, Francesco is staying out of the kitchen but Stefano has quit. Business was picking up but they lost their Michelin Star. He revisits for a second time and business is slower again. Gordon goes to see why people aren't visiting, the public still think the restaurant is overpriced. The prices are lower but still more expensive than other restaurants in the area. Gordon demonstrates that by tweaking the recipe he could lower the price without compromising quality but Francesco refuses to put prices down again. The Walnut Tree Inn closed in February 2007 and Francesco became Restaurant Manager at La Petite Maison in Mayfair. The Restaurant was reopened in December 2007 by chef Shaun Hill, has excellent Trip Advisor reviews and has been very successful, see their website here. The restaurant was named AA Restaurant of the Year in 2008 and gained a Michelin Star in 2010. Head Chef Spencer was working at The Swan Inn in Chiddingfold and Stefano was working at Osteria Emilia in London. 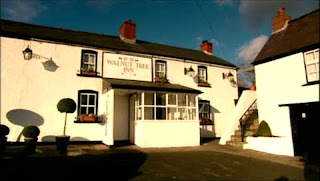 The Walnut Tree Inn aired on May 11 2004, the episode was filmed in 2003 and is Ramsay's Kitchen Nightmares UK season 1 episode 3. He said the one thing that drives me up a wall: "I don't care what they [the locals] think". As a business owner, it doesn't matter how "right" you think you are if no one comes in to do business with you! And yes, he's right in that if he could sell two of his scallop dishes he'd have paid for the shipment, but if no one comes in to buy two scallop dishes before the shipment goes bad because you're too stubborn to lower the price...Of course, not listening to Gordon Ramsay seems to be a common theme. People don't like to be told they're wrong, especially when it's something in which they've invested so much of themselves. It constantly amazes me that these people call in Gordon Ramsay begging for his help, and when he shows them what's wrong they dig in their heels and won't listen. It's not like Chef Ramsay shows up of his own accord. These restaurants apply for his help. This was a classic case of someone not understanding their surroundings. Francesco may have done a decent job running a restaurant in London but he wasn't in London any more and his attitude and approach managed to wholly alienate the locals. Whatever talents he may have had, they were ill-suited to managing a restaurant like the Walnut Tree and it comes as no surprise that he is back in London. That both the previous and later owners managed to succeed where he failed pretty much says it all. This was one of my favourite episodes because it showed a lot of the dynamics around staffing issues and food pricing (two elements which are overlooked mostly on the US version, for instance).